Last night I spent a long time thinking, wondering if more of us here on Planet Earth would hold peace, love, and hope in our hearts; if we would be happy with what we've got and not yearn for more, if... And if we did, if we could? Would it help to change the energies of hate, fear and disillusion that flow around and through this space we inhabit? I do think it will help. At least I still have the power to change my own thoughts, and I intend to work hard to make my life, my heart and my head a peaceful place, a place where hope still lives and where change is possible. 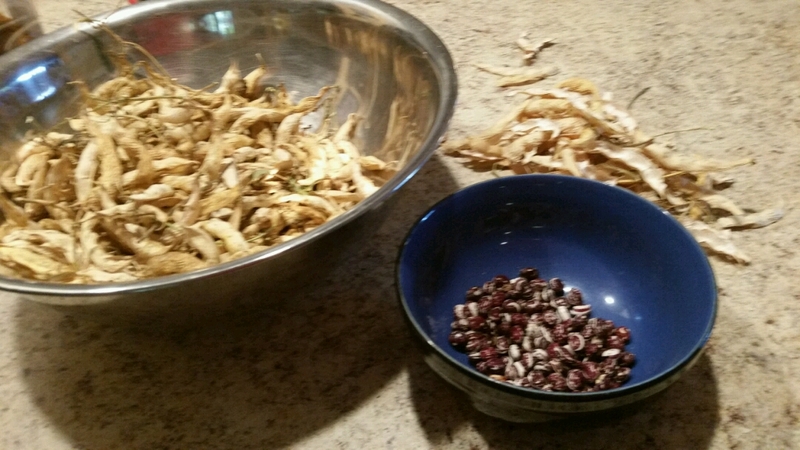 On the more practical side of living, this morning found me shelling the pole beans that we let dry on the vines and picked a couple of weeks ago. These are named Mother Stallard's Beans, an heirloom seed that dropped some pods last year and came up like crazy this year. They make a great bean soup and they are just so darned pretty to look at too. A little gift from Nature that we weren't expecting. About 1/3 of the way through "Mrs. Dalloway" and currently focusing on Peter Walsh, newly back in England after living in India, and while there falling in love. Peter is quite interesting. Though seen as a failure by his English friends since he lives differently than they do, I see him as a success. He is one who lived by his own rules,and had great loves and many adventures. Rather than a career and material success, he chose to be free. Something of a underdog, this Peter, but then I am always a fan of those who opt for the "road less taken." Had thoughts of going for a walk, but once again it is raining and I am appreciating the heck out of that. Amazing how quickly the grass gets green after the rain. The dust is all washed off (only if you have gravel road experience can you know how great that is) and it feels as if everything is breathing a sigh of relief, including me. When the rain lets up, I need to go to town to get some mushrooms for this evening's meal and maybe I'll be able to get in a short walk then. Until then there's always knitting, just turned the heel on a pair of socks and found all the needles I need for the sweater. But, I'm thinking I need to get out of the house since it's been days. I've been asking myself similar questions a lot these days. And getting out is good even if it's just a walk. I agree. The anger and the hate that seems to be welling up in people especially since Lord Dampnut took over is hell. It's not easy to meet anger with love or at least peace but it's what we have to do. Aw, I love you too! Oh my goodness, just last night I was surfing the net trying to just, I dunno, get out of my own head for a minute, when one of those pop-up ads started which ordinarily annoys the hell out of me. But then there were these really majestic piano chords and a sort of poetically-cadenced narration and I started listening. And I like it so much that I actually bookmarked the thing and it turned out to be some kind of promotion by the Marriott Hotel chain. But it's quite strikingly similar to what you're saying and, in my opinion, worth a listen. Even made me consider writing to the Marriott folks because it really seems that they, like yourself, are trying to find a way through these depressingly dark times. Here's the link, I hope: http://goldenrule.marriott.com/?scid=f7ec4702-3106-4d82-b98e-5da27257fa72&mid=%2F. Yeah, that's what I'm talking about. Amazing you found it and via a commercial, but we're in sync like that. I hear you on using the internet to get out of your head. I do that too. In spite of trying to change the landscape of my mind, there's a lot of ugly places in there. I too wonder why materialism has steered us off the road to peace and tranquillity. I do not follow any religion as i think that it is all hokum but we need a new form of humanism to save the world. I don't find the answers in religion either, but I wo der where we will end up if things don't change. Sure don't feel I'm leaving s better world for my grandchildren. Thanks for the comment and the understanding.